Industrial steam > Why Deaerate? 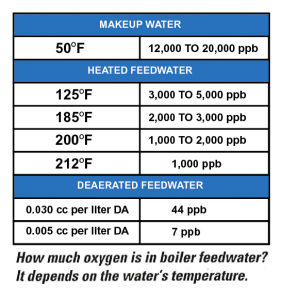 Deaerating boiler feedwater can result in longer equipment life, reduced pipeline and equipment-replacement costs, and lower overall maintenance, regardless of boiler-plant size. Dissolved oxygen is up to 10 times more corrosive than carbon dioxide, especially at higher temperatures. For example, water is 21/2 times more corrosive at 195°F than it is at 140°F. The cycling of dissolved oxygen prevents equilibrium, as ferrous hydroxide is removed continuously from the solution. The reaction will continue until oxygen is removed completely from the water or the metal completely dissolves. 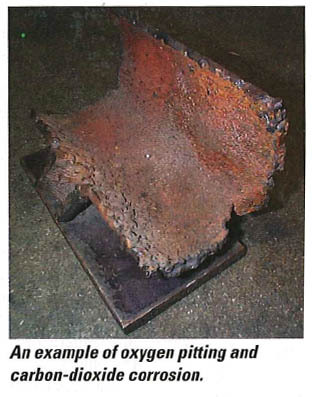 Oxygen corrosion generally occurs as pitting. Even though only a relatively small portion of a metal is lost, failures still can occur. Carbon dioxide is the usual cause of steam- and return-line corrosion, characterized by a general thinning of the pipe wall or grooving along the bottom of the pipe. It is extremely important that the carbon dioxide liberated by thermal decomposition in a boiler be deaerated immediately and not allowed to recycle or concentrate in the steamc ondensate cycle. Through efficient feedwater deaeration, the free, gaseous carbon dioxide dissolved in most natural water is almost completely eliminated initially and, thus, typically is not a major factor. In addition to removing free oxygen and carbon dioxide, a deaerator using steam as the scrubbing gas provides the advantage of heating boiler feedwater. Adding hot feedwater to a boiler greatly reduces the chance of thermal shock caused by the expansion and contraction of heating surfaces. In systems with on-off pumping cycles, a pump’s flow rate must be substantially higher—both to make up lost ground and to maintain steam requirements. These on-off cycles, even in deaerated systems, upset thermal circulation by surging or flooding boilers with excess water, collapsing active steam bubbles. This can cause unstable water levels and fluctuating firing rates. An on-off system imposes an unstable load on a deaerator, causing it to react cyclically and operate at perhaps two to three times its design capacity for one-half to two-thirds of the time. This is similar to trying to average 50 mph on a long trip by driving 100 mph one hour and resting the next. All deaerators should be equipped with centrifugal pumps suitable for modulating service, while allboilers should be equipped withfully modulating feedwater regulators. Putting water into a boilerat the same rate it leaves in the formof steam makes sense. Air is an excellent insulator. When allowed to concentrate in process equipment, it significantly impairs heat transfer. Because air is not kinetic in giving up heat, it tends to plate out on heating surfaces. Under certain conditions, as little as 0.5 percent of air by volume can reduce heat transfer by as much as 50 percent. While it is vitally important to rid systems of unwanted noncondensable gases as quickly as possible, it is equally important that those gases not be allowed to enter systems in the first place. High-pressure returns that otherwise would be trapped to atmosphere can be trapped directly back to a deaerator. The flash steam from an average high-pressure trapped system recovered by a deaerator can amount to 20 percent of the fuel required to provide heat for that process. Making low-pressure systems trapless and pumping condensate directly into a deaerator can save up to 6 percent in fuel. Exhaust steam and flash steam otherwise lost to atmosphere can be used preferentially by a deaerator to preheat makeup water. Energy savings also may be realized with an effective blowdown heat-recovery system. Up to 3-percent fuel savings are possible, with pay back often realized in a matter of months. Continuous blowdown heat recovery can be in corporated into a deaerator cycle at minimal installation cost and without the need to shut down the boiler system. Most new deaerators incorporate continuous blowdown heat recovery. Although many feel it is part of normal maintenance, the repair and replacement of condensate lines, boiler tubes, etc. can be made unnecessary with a deaerator. Few engineers consider the installation of a steam boiler without seriously considering that of a deaerator as well. Theoretically, when the vapor pressure of water and the solution pressure of dissolved gases appreciably exceed the pressure imposed on a system, the gases become insoluble. Water simply cannot contain dissolved gases at saturation temperatures, such as 212°F, at atmospheric pressure or 250°F at 15 psig (assuming sea-level conditions). • Temperature—heating to full saturation temperature, as described above. or mixing to shake out dissolved gases. This scrubbing action is required so that water overcomes the surface tension and viscosity that retain dissolved gases. • Thin film—to reduce the distance dissolved gases must travel. This also enhances the heating process. • Time—the more time allowed for the three activities above, the more effective the deaeration. • Venting—the opportunity for liberated gases to escape from the cycle. This process can be demonstrated with a simple experiment: Fill a fairly large pan with cold tap water, andput the pan on the stove at the stove’s highest setting. As the water heats, you will observe small bubbles accumulating on the side and at the bottom of the pan. You might conclude you are seeing steam bubbles when, in fact, you really are seeing air coming out of solution. As the temperature nears boiling, more and more bubbles will form until, at just a few degrees before boiling, literally thousands of bubbles will be visible. When the water starts boiling vigorously (saturation temperature), the air bubbles will disappear by virtue of the turbulence of the liquid. If you had used a frying pan and just put in a thin film of water, you would have noticed the reaction occurring much more rapidly; of course, the longer you let water boil, the lower its oxygen content will be. Because most single-shot-type deaerators have only a few seconds to perform the above function, time becomes a problem—particularly if the plant load is unsteady. Modern recycling or triple-effect deaerators ensure full deaeration at any load at any time. Bear in mind that ground water can have up to 20 ppm of dissolved oxygen, and a deaerator must reduce this to a level of 7 ppb in a matter of seconds—a total reduction of nearly 3,000 times.